The Honest Company is a company created by Jessica Alba and Christopher Gavigan. The name explains it all, honest. The Honest Company has strong family values to provide safe products for babies and for families. I first heard about The Honest Company from my Aunt Aimee, she uses The Honest Company for little Quincy, and sfter hearing her rave about The Honest Company, I had to get in on these amazing products. In all honesty, these products from The Honest Company motivate me to keep safe products in the home. I have always been a fan of keeping safe products in the home, especially when there are children around. There are toxic chemicals in "traditional" products. You would think those other products are safe, but in reality, those "other" products have harsh chemicals. The antimocrobial chemical in antibacterial soap is called triclosan. It is said that it can disrupt thyroid function, and change hormone levels in people. Also, an overuse of antibacterial soap and other antibacterial chemicals can promote the growth of bacteria that resist antibacterial chemicals. There are many viruses that cannot be treated with antibacterial chemicals now because of today's overuse of antibacterial chemicals. 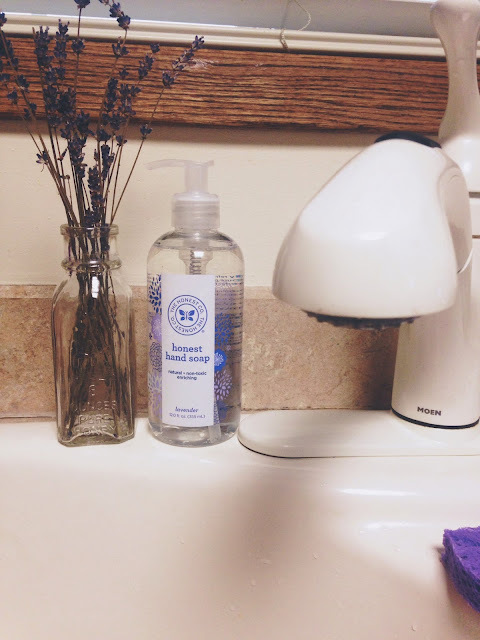 With The Honest Company, you can have peace of mind that their hand soaps do not cause health problems. The Honest Company says what their hand soap is free of right on their website. You don't have to hunt for the health in Honest. The Honest Company hand soap is free of triclosan, synthetic fragrances, formaldehyde, and allergens. They have a whole list of what their award winning hand soaps are free of. It is totally and completely mind freeing that you are indeed cleansing and washing your hands without putting harsh chemicals on your hands. I love this soap! It is such a soft soap, easy to lather, and the natural lavender fragrance is cheerful. After going through countless lectures of handwashing at CAL, and actually learning how to properly, and correctly wash my hands, I am pretty crazy about handwashing, and cleanliness. 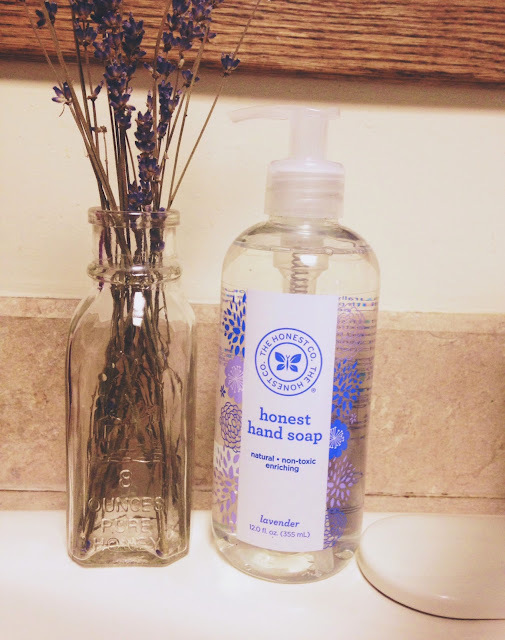 The Honest Company puts me at peace of mind because I know I am actually cleaning my hands. I am also motivated to clean my house with The Honest Company products. I am in love with wiping down counters, tables, even my technology with The Honest Company's Multi-Surface cleaner. On our kitchen counters, we keep some fruits and veggies of the counter, and cleaning the counters with The Honest Company's multi-surface cleaner, I know that the food I put on the counters are not going to be sitting on a bunch of harmful chemicals. The Honest Company provides information on what harsh chemicals can be found in other multi-purpose cleaners, such as: Amonia, which can cause severe coughing, wheezing, chest pain, and even asthma and can increase blood pressure. Another harsh chemical that can be found in traditional multi-purpose cleaners is ethelyne glycol monobutyl acetate... First of all, that is a mouthfull to even pronounce, second, do we even know what it is? It is a chemical that when absorbed through the skin, it can damage internal organs. Red flag! That is what we are cleaning our counters with, putting our food on, and potentially consuming! 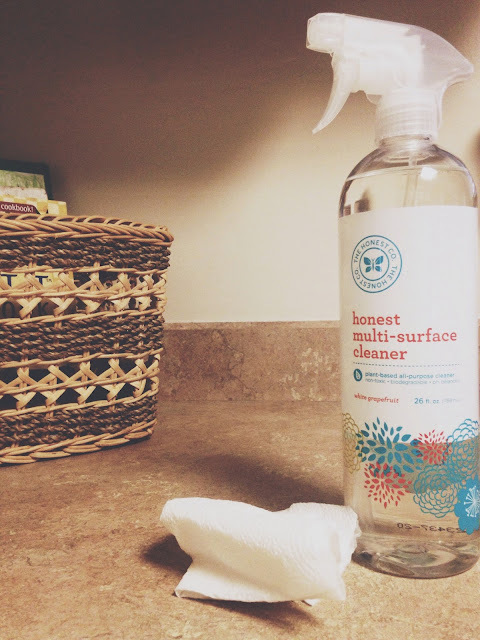 The Honest Company says right on the front of their multi-surface cleaner that the product is non-toxic. A sigh of relief. The pleasant scent of white grapefruit provides an optimistic mood, and gives the room a sense of freshness. The scent is from grapfruit essential oil, which I am a big of! Honest's multi-surface cleaner is totally free of ammonia, synthetic fragrances, chlorine, bleach, triclosan, and other harmful chemicals. It says what the cleaner is free of right on the bottle! I honestly love cleaning the counters with this multi-surface cleaner. It can even be used on wood, granite, porcelain, and electronics! Like I said before, I like to wipe down my phone and my iPad, and the TV remotes with this multi-surface cleaner from The Honest Company. My mom loves the multi-surface cleaner. She was using it earlier today actually, and she commented that it doesn't have that chemically smell that other cleaners have. It doesn't have that chemical smell because Honest doesn't put those harsh chemicals in their products. 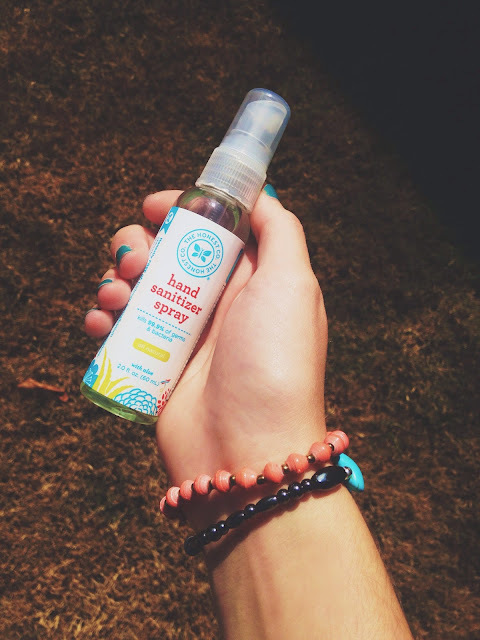 This last Honest product I am reviewing is the Honest Company's hand sanitizer spray. I am a person who is known for the array of hand sanitizers in her purse. I am kind of a germ-a-phobe, but I am even more frightened of triclosan. That is the first ingredient on the list of what this hand sanitizer spray is free of. Along with triclosan, there is no benzelkonium chloride (??? ), phthalates, parabens, chlorine, or formaldehyde! They have a list of what their products are free of on their site. That is impressive to me. I love using this sweet smelling hand sanitizer spray. I spray it on the cart handles at the store, and it is perfect for a quick hand cleansing on the go. I love that the Honest's sanitizers are safe! It is quite scary to think about, you trust your hand soap and cleaning products to protect you from harmful diseases, and germs, but yet they actually have harmful chemicals that can be detrimental to your health. With the products from The Honest Company, you can trust that they have no harmful chemicals, and that they stay true to their company name, The HONEST Company. This company is wonderful, and holds great values with keeping their products safe for the whole family. Below I have listed The Honest Company's website. Be sure to watch Jessica's and Christopher's video on why they created The Honest Company.